Avast Ye Landlubber! Look to the sea on Saturday, February 9 to spot the 25th Anniversary of the Pirates of Lost Treasure Mardi Gras Flotilla! A portion of the proceeds will go to benefit the Secret Santa Inc.! Fleet departs at HOLIDAY HARBOR MARINA at 10:45 a.m. and we'll blast the booty at the Sunset Grille and continue East to the Oyster Bar, turn back west to the Perdido Bay Seafood docks, Galvez Landing, the docks along Ole River, ending at the docks at Flora-Bama. These businesses will be opening early with specials for the Flotilla! After the pillaging at the Ole River Bar, we'll celebrate our victory with a party at the Flora-Bama (dome tent) at 1:30 p.m. for LIVE MUSIC and a Red Beans & Rice Special for only $5.00. Awards at 2:30 p.m. with a 50/50 drawing and "Grog" Treasure Chest Raffle immediately following awards. Vessel Registration fee: $25.00 per boat. Everyone is welcome to enter! 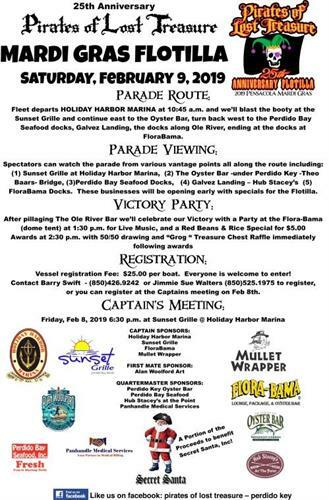 Contact Barry Swift- (850) 426-9242 or Jimmie Sue Walters (850) 525-1975 to register, or you can register at the Captains meeting on the Feb 8th.